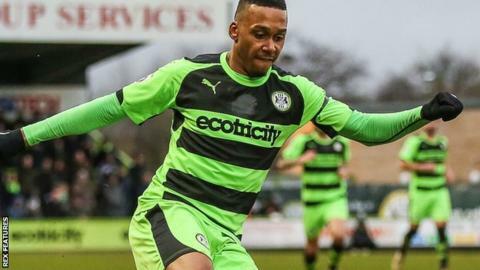 Forest Green Rovers reached the National League promotion final with a 2-1 aggregate win over Dover Athletic. Ricky Miller's deflected goal had drawn an improved Dover level on aggregate. But Keanu Marsh-Brown's curler for Forest Green, who sacked manager Ady Pennock on 27 April, sent them through. Mark Cooper was at the New Lawn to watch Forest Green after resigning as Notts County boss earlier on Saturday and BBC Radio Nottingham reports he is set to become Rovers' new manager. Caretaker boss Scott Bartlett has taken charge of the Gloucestershire's club's last three games - all against Dover - since Pennock was dismissed to "boost the club's chances in the play-offs". A spirited Dover created enough chances on the night to at least force extra-time but Miller blazed wide from close range and Sam Magri struck the underside of the crossbar. Marsh-Brown's goal was a near-replica of the quality, curling effort into the top corner from Brett Williams that had won the first leg for Forest Green, who finished second in the table in the regular season. After the match, Rovers owner Dale Vince told BBC Radio Gloucestershire that Bartlett would take charge of the side for the final at Wembley on 15 May. Braintree host Grimsby in the second leg of their semi-final on Sunday, leading the Mariners 1-0 from the first leg. Forest Green Rovers caretaker boss Scott Bartlett: "The boys have been fantastic. Our preparation has been spot on all week. "I'm calm because I know they are going to give me everything. It would take a good side to beat us. "Dover pushed us and pushed us and pushed us. It was never comfortable. They've done well. Full credit to them." Dover boss Chris Kinnear: "I thought we deserved something. We had so many chances. I'm just very, very disappointed, but you've got to look at the positives. "The club is moving on steadily. I'm proud of the lads. You can't ask any more. "Today they gave everything. But somebody has got to lose and good luck to Forest Green." Match ends, Forest Green Rovers 1, Dover Athletic 1. Second Half ends, Forest Green Rovers 1, Dover Athletic 1. Substitution, Dover Athletic. Tyrone Marsh replaces Sam Magri. Substitution, Forest Green Rovers. Clovis Kamdjo replaces Darren Carter. Attempt missed. Keanu Marsh-Brown (Forest Green Rovers) right footed shot from outside the box misses to the right. Attempt missed. Ricky Modeste (Dover Athletic) right footed shot from outside the box misses to the right. Substitution, Forest Green Rovers. Jon Parkin replaces Brett Williams. Attempt missed. Chris Kinnear (Dover Athletic) right footed shot from outside the box misses to the right. Attempt missed. Ricky Miller (Dover Athletic) left footed shot from the left side of the six yard box misses to the right. Attempt missed. Sean Raggett (Dover Athletic) header from a difficult angle on the right misses to the left. Sam Magri (Dover Athletic) hits the bar with a right footed shot from the centre of the box. Attempt missed. Kieffer Moore (Forest Green Rovers) right footed shot from the centre of the box is too high. Foul by Ben Jefford (Forest Green Rovers). Goal! Forest Green Rovers 1, Dover Athletic 1. Keanu Marsh-Brown (Forest Green Rovers) right footed shot from outside the box to the top right corner. Assisted by Rob Sinclair with a cross. Substitution, Forest Green Rovers. Kieffer Moore replaces Elliott Frear because of an injury. Goal! Forest Green Rovers 0, Dover Athletic 1. Ricky Miller (Dover Athletic) right footed shot from outside the box to the bottom left corner. Attempt missed. Darren Carter (Forest Green Rovers) left footed shot from the centre of the box misses to the left. Assisted by Elliott Frear with a cross. Second Half begins Forest Green Rovers 0, Dover Athletic 0. First Half ends, Forest Green Rovers 0, Dover Athletic 0. Attempt missed. Charlie Clough (Forest Green Rovers) header from the centre of the box is too high. Assisted by Elliott Frear.